The graph of y = 0.5x2 is shown. Assume that the coefficient of x2 for all three graphs is 0.5.
a. Find the equation of Parabola A.
b. 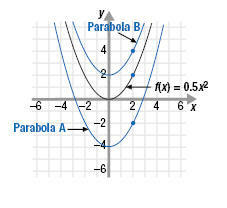 Find the equation of Parabola B.
a. Parabola A is the graph of f(x) = 0.5x2 shifted down 4 units. 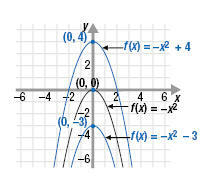 So, it is the graph of the function f(x) = 0.5x2 - 4.
b. Parabola B is the graph of f(x) = 0.5x2 shifted up 2 units. So, it is the graph of the function f(x) = 0.5x2 + 2.
a. The function f(x) = -x2 has the same shape as f(x) = x2 but, because of the negative sign, it opens downward. To see this, we can calculate and plot a few ordered pairs. b. The graph of f(x) = -x2 + 4 has the same shape as f(x) = -x2 but is shifted up 4 units. c. The graph of f(x) = -x2 - 3 has the same shape as f(x) = -x2 but is shifted down 3 units.